New Terror Laws will help Foil Terrorist Attacks? POLICE have admitted there are potential suicide bombers living in Australia but tough new laws will help foil terror attacks. CRITICS of Australia’s tough new anti-terror laws are passing judgment from a non-existent, ideal world. UBERKIWI: How is electronic shackling going to stop a suicide bomber? Wouldn’t electronic shackling make them more angry and suicidal? The Australian also revealed that ASIO believed there were as many as 800 people of interest in Australia, some of whom could be inspired to carry out a terrorist attack. Australians are now being asked to accept that hundreds of residents are potential terrorists. Perhaps the situation has deteriorated recently or possibly the meaning of “terrorist suspect” has been redefined. But both Mr Keelty and Mr Ruddock rejected reports quoting security officials on the number of Muslim extremists in Australia. Why wait so long to review anti-terror laws? Unbelievable story over the last week or so regarding the deporting of US peace activist Scott Parkin. There is stuff all over the SMH and “The Age” so I wont go into details except to say that it is so blatantly medieval and fascist-state like that it is hard to believe. US High School history teacher and anti-violent protest peace protestot had been talking at peace rallies about non-violent protest. ASIO and police swooped on him at while in a Cafe saturday last. Locked up with no explanation. Parkin was given an invoice for A$11,700 for the costs of his detention, airfare for himself and the two security guards who the government insisted accompany him, as well as the cost of the guards’ acommodation in Los Angeles. Under Australia’s punitive migration law, the Australian government bills those who are imprisoned for the costs of their imprisonment. It doesn’t matter if they fled oppressive regimes and arrived without documents. He was in the country legally. The government wont discuss it. Rumour is it was at the request of Halliburton. The deportation of Parkin is an ominous portent of how new anti-terrorism powers can and will be used by a government that, as of July 1, has a majority in both houses of the national parliament. Illustrates how a government will invoke ‘national security’ in an attempt to justify the denial of basic legal rights and muzzle legitimate public debate. Most Aussies more concerned about the price of Petrol than the loss of their rights. MarkB – it’s all your fault. Latham would have told Halliburton to get f****d.
Sydneysiders are reeling this morning over news that Al Qaeda has announced Melbourne as a possible new target of their worldwide campaign to scare the p*ss out of people. This is being seen as a major snub in social and political circles of the 2000 Olympic City, and leading Sydneysiders are calling on Al Qaeda to reconsider their choice of future targets. The Al Qaeda announcement is also expected to make it even harder for Sydney politicians to redirect millions of taxpayer dollars from spending on education, child care and medicines for the elderly to buy CCTV cameras and other anti-terror related security measures. “It’s terrible news,” said one Sydney security specialist who has been campaigning for the NSW government to spend $100 million on his line of robot dogs that sniff out bombs concealed in the buttholes of Islamomaniac poodles. If Sydneysiders are disappointed by the Al Qaeda snub then Melbournians are absolutely gloating at the news that hit front pages and headlines around the world today. Fashionistas down south claim the Al Qaeda announcement is yet another sign of just how “cool” Melbourne had become. Michael Robertson, the founder and Chief Executive Officer of Linspire writes about the Google, Microsoft, Yahoo! Battle For Net Supremacy in his article “Google, Microsoft, Yahoo! The Battle For Net Supremacy“. I was pleased to see he is in complete agreement with my views on Microsoft. The article compares how the three rivals are dealing with the competitive threat between each other, and as he says, it says a lot about their individual company culture, management and DNA. The only way Microsoft knows how to operate is with an enemy in their crosshairs. A few years back, Linspire (then Lindows) was the recipient of Ballmer’s profanity-laden tirades. But Microsoft’s attention has since been somewhat diverted from the ambiguous threat of Linux – which doesn’t present a singular target – to Google, whose O’s make convenient bull’s eyes. Look for Microsoft to employ the same approach they have used historically to fight competitors. First they will use technology barriers within new versions of their operating system to dramatically favor their own products and discredit competitors. With previous competitor DR DOS, they embedded intentional incompatibilities, spurious error messages and bogus issues of compatibility. With Netscape, they deeply embedded their own products and falsely claimed they could not be removed. Expect much of the same with Vista, their newest OS. In addition, look for exclusionary contracts that preclude computer manufacturers from pre-installing links and software from Yahoo! and Google on PCs they sell. With the same unethical management in place, a legal process that takes years to litigate, and inevitable legal penalties only representing a tiny fraction of profits, you’d be crazy not to expect Microsoft to extend the same behavior you’ve seen over the last two decades into the next. Read the rest of the article, about Google and Yahoo here. The Nation has published some great quotes here from before and after Katrina. Head coverings are un-Australian – according to some bird in the Australian government. Perhaps there are some other things that should be labelled as un-Australian! 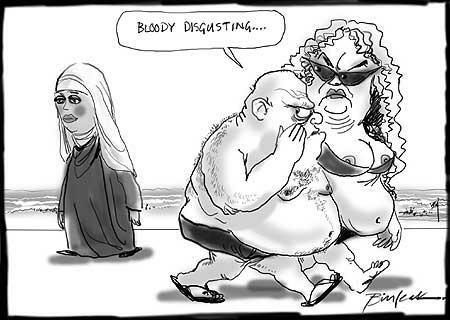 Bill Leak is The Australian’s daily editorial cartoonist.